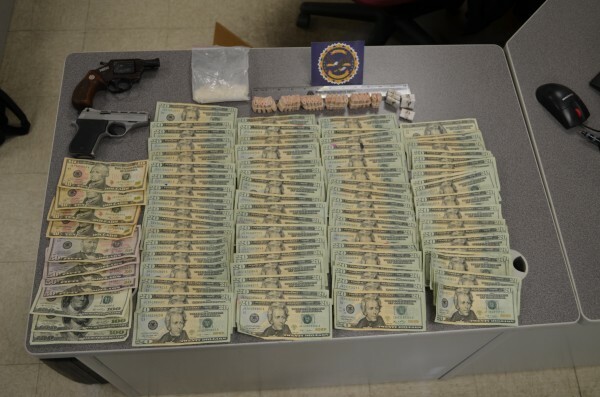 Two handguns, $2,100 in cash, more than $11,000 worth of heroin, and 40 grams of an unidentified substance were among items police seized Wednesday, Jan. 23, 2013, in Ellsworth during a drug bust at a home on Water Street. Matthew Wright, 33, was arrested as a result on a charge of aggravated trafficking in drugs, according to Maine Drug Enforcement Agency. BRUNSWICK, Maine — Now stronger, easier to score and cheaper than other opiates, heroin has made a comeback in Maine over the past year. Police and medical experts are relating this surge to new MaineCare rules that have cracked down on the availability of prescription opiates, such as OxyContin. Heroin trafficking arrests have increased recently, as have admissions for opiate addiction treatment. said Brunswick police Detective Rich Cutliffe, an MDEA agent with the Portland Task Force. Prices vary across the state, with a “fold” or “bag” of heroin — .05 to .1 gram — costing $20 to $30 in Brunswick. For the same high, a 30-milligram oxycodone pill costs $30 to $40, Cutliffe said, and “the oxys are more work” because new chemistry makes the pills turn to gel when they come in contact with water, so they are harder to shoot intravenously. “What I’m getting from people is heroin is cheaper and your high is stronger,” Cutliffe said recently. Last year, Cutliffe said he arrested very few people for possession of heroin and none for trafficking. So far this year he’s made seven heroin arrests — all for trafficking. MDEA supervisor Jim Pease, whose area includes Knox, Lincoln, Waldo and Sagadahoc counties, also said heroin use in those areas has increased in just the last six months as the price of oxycodone has risen. Furthermore, high-profile arrests in Lewiston, Rockland and Ellsworth this year shut down oxycodone rings, making it more difficult to find the drug on the street, according to police. “It’s not surprising that as the number of pharmaceutical drugs on the street goes down, we will see the void being made up with heroin,” said Brent Scobie, director of research and planning at Acadia Hospital in Bangor. The number of patients seeking treatment for heroin use in the state increased 16 percent when comparing the first quarter of 2011 to the same time period in 2012, according to data from the Maine Department of Health and Human Services. And admissions for the first four months of 2013 were higher still, up nearly 18 percent over the same period in 2012. A leading addiction medicine specialist says the dire consequences of widespread heroin use are not far behind this trend. Many of the new heroin users are “novice IV drug users who don’t know clean needle technique and are more likely to share needles,” said Dr. Mark Publicker of Mercy Hospital Recovery Center in Portland. “As a consequence, I think we can anticipate HIV. We’ve never seen a lot of HIV [in Maine]. And I think we’re about to see significant increases in hepatitis C. And the other thing we’re going to see is an increase in crime,” he added. The new rules, which went into effect Jan. 1, set new limits on the amount of opioid painkillers — such as OxyContin and Percocet — that physicians can prescribe, shortens the length of time they can be prescribed and narrows the list of pain conditions that warrant the drugs. According to state law, doctors can now only prescribe a 15-day supply to patients of MaineCare, the state’s health care program for the poor, and are limited to three 15-day refills with prior approval. To prescribe opiates for more than eight weeks, a physician needs a second opinion from a doctor outside their practice. The law also precludes prescribing opiates for certain conditions. Kevin Flanigan, medical director of MaineCare, said pinning any increase in heroin use to the MaineCare changes would be difficult because the new law is only five months old and data is sparse. Opioids are less effective for treating pain that lasts longer than eight weeks, he said. The new law provides insurance coverage for other types of treatment to manage pain, including cognitive behavioral therapy and acceptance commitment therapy, where a patient “accepts their condition, commits to the management of it and goes forward,” he said. Still, Flanigan said those who determined how the new law would work realized that the change — along with new restrictions in the MaineCare law regarding treatment with suboxone and methadone — means some MaineCare members might need more addiction services after the change. Tom Kivler, director of the Division of Behavioral Health at Mid Coast Hospital, said patients he sees at the Addiction Resource Center in Brunswick reflect that recent increase — although the majority of people he treats are seeking treatment for both opiate painkillers and heroin.